These are pictures of Haida Coastal Native Totem Poles taken in British Columbia, Western Canada. I took the one on the right before the days of my digital camera so in fact, it is a picture of that picture! Because it was central to the reason I wrote the poem I wanted to share with you, I included it here. The one on the left is a much better picture of what these totem poles really look like, all painted in bright primary colours. Totem poles captivated me and it was easy for me to wonder about their stories and what they really represented. And as usual, the picture, once hanging on my wall, was just begging me to write a poem! 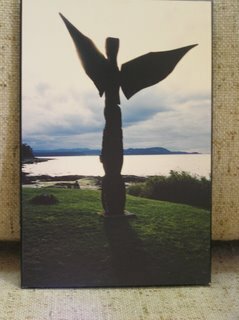 Totem pole erected, stark against the horizon. While ferries float to and fro beneath your stare. And carefree, vacationing kids aim stones at the raven's eyes. And with the knowledge of who you are. Mother of Invention, still in awe. I have always been fascinated by Indian lore. I got a much better understanding of it from "Fools Crow" by James Welch. I would love to experience that mentality that is so caught up in the symbols of nature. Reya comes closest to this of any white person I know. Barbara: Yes, me too! Our busy urban life and its rapid pace gets in the way of their nature philosophies I guess. You're right, Reya does seem very much like that, as does my first massage therapist who was Mother Nature herself. She was a herbologist, acupuncturist, and did naturopathics and homeopathics too. Barbara: Doesn't my machine recognize me anymore?!! Ruth!!! What a cool monument a Totem Pole is. I love what you say; "above them, past them through them". It spaeaks to me of how rude all these impermanent things truly are. Steve: Thanks for your visit and comment! I'm glad something I wrote spoke to you. I hated how those kids treated this beautiful monument. Travelling across the US I was priveledged to see many totem poles. They are amazing. So is your poem! Old Lady: They are all different aren't they? I love the idea of totems. I did this poem for Gr. 7's and we made our own totem pole designs afterwards. I did one too to show them. Was neat to see what they chose for their own identities. Thanks! 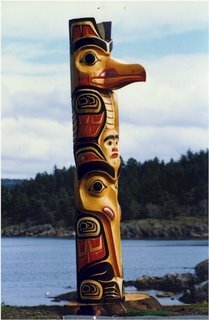 Totem poles are so unique and tell amazing stories. The work behind their creation, the meanings behind each segment, it's all beautiful. I liked looking at these pictures and reading your poem about them. Made me sit back and remember the first time I saw a totem pole or heard about one. Nice. I love the way your poem is even shaped like a totem pole and how the words and flow give the inner calm feeling of looking up at and honoring one. Totems always seem to quiet my soul. I suspect its the ancientness and symbolism they hold. Beautiful. Brooksba: Thanks! The work involved must be amazing, perhaps a skill passed down from generations long gone. I do think they carve some of their own spirit into these storytellers and that you need to honour that. Maggie: Wow! You're the only person who noticed that it was shaped like a totem pole! It happened quite by accident...the magic of the Muse, I guess. I just decided to use the centre button on impulse and then was amazed as it lined up the words in that shape right before my eyes! From then on, I usually use the centre thing..it just looks neat and does help with the flow you commented on and allows you to put in the breaks at the end of lines or ideas more effectively. It's great for stream-of-consciousness writing too. It just spills out in form. Thanks! Majestic words to match the image! Colleen: Thanks> I wasn't so sure any words could do it justice but had to try. Oh Mother they are great pics! Have you ever taken a trip to Hull to the Museum of Civilization (formerly the museum of man)? My friend is the head curator there. About 10 years ago she was able to revamp the Native Exhibit. The majority of the the museum is now dedicated to the Native Study department. They have great totems there, and a huge collection of canoes. Not quite as many as the Peterborough canoe museum, but a great exhibit none the less. All of the poems this week are lovely. Thanks, Lynn. No I haven't been but wouldn't mind that trip, as well as the canoe museum. We used to take our classes to St. Marie Among The Hurons and it was such a neat place.